Merrry Christmas to my peeps! | Separated by a common language. Merrry Christmas to my peeps! Hark! 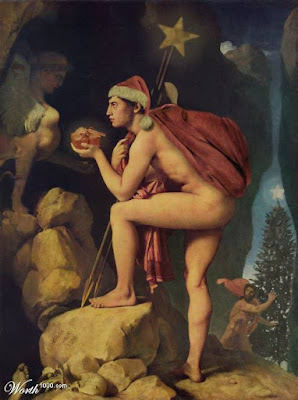 The naked angel dude with a gift wants everyone to have a nice, happy Christmas! You can say that again! Ooooohhhh yeah! I looked at the chicken lady after, and really I guess she’s the star of the show! Hah!